Battletruck Films - 92 min. Cast: Michael Beck, Annie McEnroe, James Wainwright, Bruno Lawrence, John Bach, John Ratzenberger. Screenplay: Irving Austin, Harley Cokliss, John Beech from a story by Michael Abrams; Photography: Chris Menges; Music: Kevin Peek; Producers: Lloyd Phillips & Rob Whitehouse; Director: Harley Cokliss. 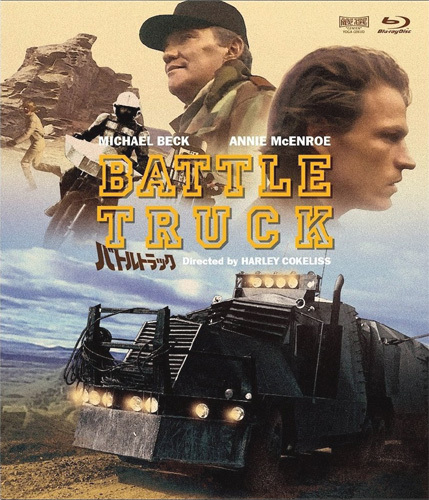 Rural survivors of the oil wars are terrorised by roving military-style bandit Colonel Straker and his men, who travel and fight in a heavily armoured truck. For most, the choice is capitulate or die. Hunter, however, believes that there is always a way to fight back. Romantic interest takes the form of Corlie, whom we later discover is Straker's daughter. 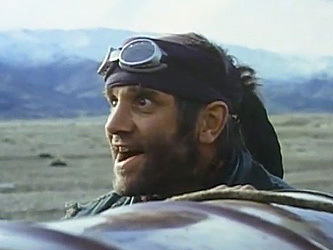 Hunter may be rather cool and undemonstrative for the most part, but when one of the more cowardly and underhanded farmers attempts to murder him and captures Corlie for delivery to Straker, it really gets his dander up. Available in PAL and NTSC vhs videos. Expect new copies, if you can find them, to be at least $50. Used NTSC copies can be found in the U.S. for about $10-20. As of August 3, 2010, it is available on a, technically, high quality R1 ntsc dvd from North American sources, selling for about $10us. It is coupled with 'Death Sport' in a set called 'Roger Corman's Cult Classics - Double Feature'. It is presented in a 1.33:1 format with mono English soundtrack. There are no subtitles. There is an alternative commentary track with the director, Harley Cokliss, hosted by Jonathan Rigby, that provides a good deal of background. Starting 06 January 2017, an All Regions Blu-ray disc, remastered from a 2k original, became available from Japan. It is presented 1.85:1, 16x9 enhanced, with spoken DTS-HD-MA 2.0 English and Japanese language tracks. It also has an optional English DTS-HD-MA 2.0 commentary track by director Harley Cokliss and Randy Powell, hosted by Jonathan Rigby. There are Japanese subtitle options for both feature and commentary track. The disc also contains the original Battletruck trailer (3 min.) in English with optional Japanese subtitles, a trailer made for Warlords of the 21st Century (1:55) plus a small 4-page booklet, in Japanese, covering an interview with Ryu Manatsu, who was the Japanese voice of Michael Beck. It sells for about 5000 yen. Amazon (JP) is offering it for about 5200 yen, including shipping, = $70nz or $48us - Yes, you can use your Amazon account here as with all country versions, but not from a Google translated version. Within the Japanese Amazon page black band area at the top, is a small clickable "JP" label, which when clicked will offer an "EN" option. Also when you get to the address page, there is a small "International Address" clickable label which you will need to use. Most of the rest is fairly straight-forward. 1983 - SPECIAL JURY PRIZE at the Avoriaz Festival du Film Fantastique.